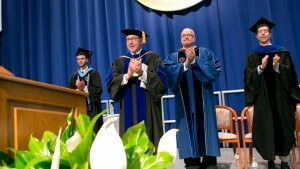 President Lewis E. Thayne, Ph.D.
Dr. Lewis Evitts Thayne, Ph.D., became the College’s 18th president on Aug. 1, 2012. 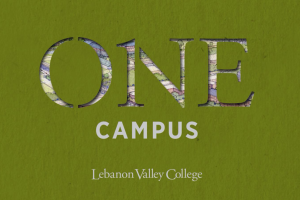 Under his leadership, LVC has added a number of innovative academic programs and centers, established plans for an enhanced campus, and made strides toward Inclusive Excellence. 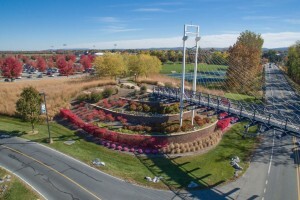 During his first six and a half years as president, Dr. Thayne has focused his efforts on innovation and on strengthening the College’s academic, alumni, athletic, enrollment, fundraising, inclusive excellence, physical plant, strategic planning, and student life areas through his leadership and vision. In academics, Dr. Thayne has overseen the addition of eight new academic programs (accounting/MBA (accelerated), analytical finance, athletic training, master's in speech-language pathology, environmental science, exercise science, international business, and speech-language pathology), the first online courses, the first major revision of the College’s General Education Program (Constellation LVC) in more than two decades, and the creation of numerous high-impact programs that benefit student and faculty learning. He created several new academic support centers—Center for Accessibility Resources, Center for Global Education, Center for Career Development, Center for Writing & Tutoring Resources, and Center for Excellence in Teaching and Learning—to help all students succeed. 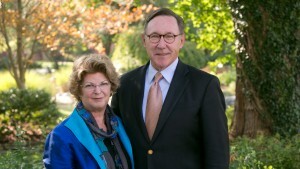 Innovation has been a consistent focus of Dr. Thayne’s presidency. 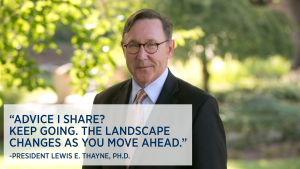 Through the creation of a series of innovation funds, Dr. Thayne has established an internal proposal-driven, grant-making economy to catalyze innovation and incubate new ideas. 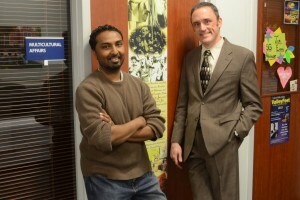 The Inclusive Excellence Fund, Edward H. Arnold and Jeanne Donlevy Arnold Program for Experiential Education, Breen Technology Fund, High-Impact Experience Fund, John Bowman Allwein Scholars Program, and Student Innovation Fund are among the programs established by Dr. Thayne to provide opportunities for innovation and engaged learning. President Thayne has made Inclusive Excellence an institutional priority since day one of his presidency. The annual Symposium on Inclusive Excellence was established in his first year in office. 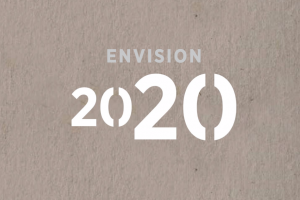 Inclusive Excellence is a strategic focus area for the new strategic plan, Envision 2020, and he has continually challenged the institution to increase diversity among faculty and staff. Under Dr. Thayne’s leadership, efforts to diversify the student body and make the College more inclusive have yielded impressive results. A leader in educational innovation, President Thayne serves as treasurer for the board of directors of the National Association of Independent Colleges and Universities (NAICU). He also serves on the board of trustees for his high school alma mater, Wyoming Seminary. 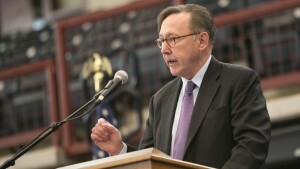 After graduating from Wyoming Seminary, Dr. Thayne earned his bachelor's and master's degrees at Rutgers University, then received his master's and a doctorate in comparative literature at Princeton University. His wife, Dorothy, is an artist and iconographer who graduated from the Rhode Island School of Design and received her master's from Rutgers University. They have two daughters, Anne and Julia; a son, Anthony; and granddaughter, Jozy. What Inspires me? The faces of my students inspire me. I see the possibilities in every one of them. I can also see the effort they are expending, the pressure they feel to do it all. 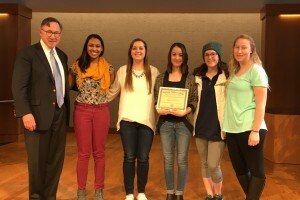 Colleges Against Cancer received this year’s President’s Service Award for activities including Relay for Life and Breast Cancer Awareness Week. Dr. Lewis Thayne, the President of Lebanon Valley College, and featured music professors discussed the strengths, benefits, and challenges facing liberal arts college, as well as, LVC's music program and launched careers. 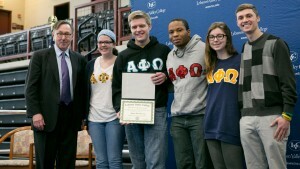 During the 2016 Symposium on Inclusive Excellence, President Lewis E. Thayne poses with members of Alpha Phi Omega, the recipients of the President's Service Award. 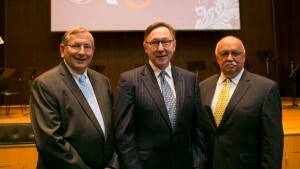 President Lewis E. Thayne posese with 150th Committee Chairs Bob Johns and Larry Bowman during the LVC 150th Kickoff Celebration.